For more information please call us at (908) 272-2550 during regular business hours and ask for Steve, Vasi or Lia. Please call for holiday & vacation schedules. DIRECTIONS: From the Garden State Parkway, take Exit 138. At the traffic light, make a left onto Kenilworth Blvd. (going west) and go about a half mile. 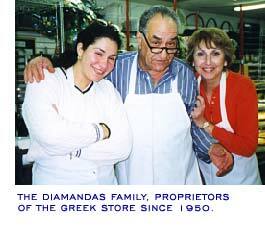 The Greek Store is located on the right side of Kenilworth Blvd. between Michigan Avenue and 24th Streets.